When I first met my husband in 1980 one of his brothers lived on Templin Avenue in Bardstown, Kentucky. It was only a year ago that we visited the Old Presbyterian Cemetery on Templin Avenue, at Fifth Street. The avenue was named for Rev. Terah Templin, an early minister who came to Kentucky from Virginia, and who is buried in the cemetery. Templin preached the first Presbyterian sermon in Kentucky. In 1942 a tablet was dedicated to him. 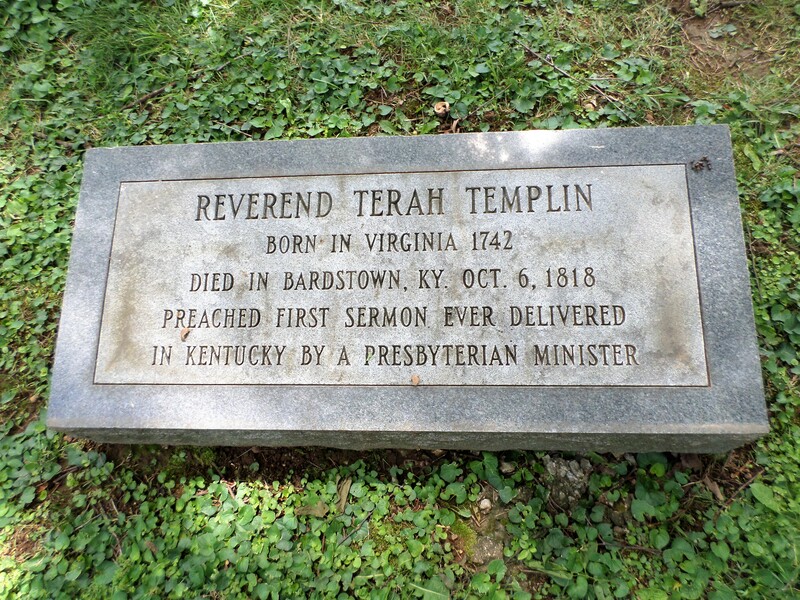 Reverend Terah Templin, born in Virginia 1742, died in Bardstown, Kentucky, October 6, 1818. Preached first sermon ever delivered in Kentucky by a Presbyterian minister. Old Presbyterian Cemetery, Bardstown, Nelson County, Kentucky. Terah Templin, a son of John Templin, was born in 1742 in Bedford County, Virginia. He was one of the first students at Liberty Hall (later Washington College and now Washington and Lee). In 1780 he was licensed by Hanover Presbytery. By 1788 he was in Kentucky; his father died that year in what was then Lincoln County, but would become Mercer County. 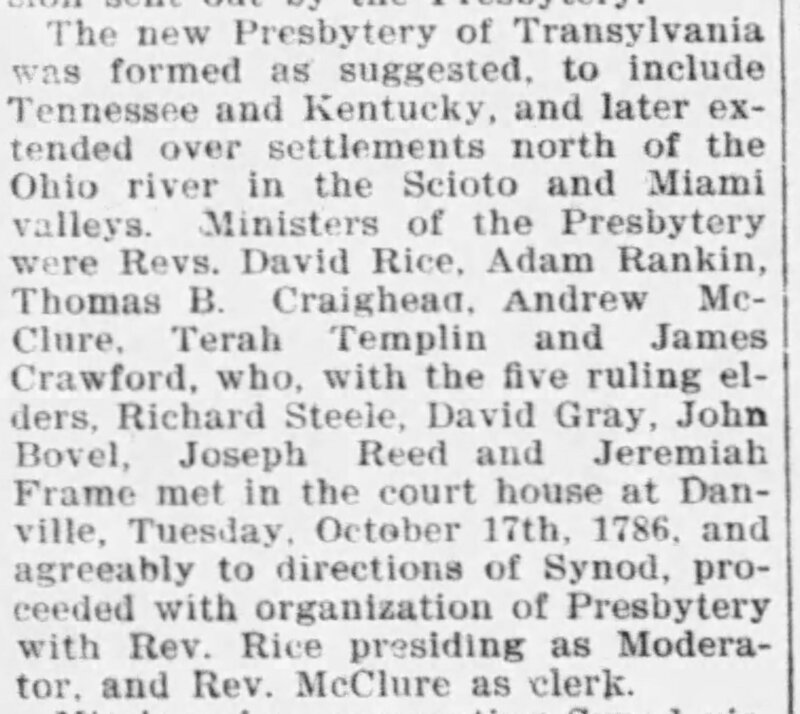 After this Terah Templin moved to Washington County, where he organized several churches, and by 1794 he was a Trustee of Transylvania Seminary. Established by an act of the Virginia Assembly in 1780, in Danville, Kentucky, and supported by then Governor Thomas Jefferson, Transylvania was relocated to Lexington in 1793. In 1799 it became a university and was the first law school and medical school in the west. He never married. Before he decided to enter the ministry, he was engaged to marry, but a few weeks before the date set for the marriage his bride-to-be died, and he continued through life a single man. In 1796 Rev. Templin moved to Logan County, along with his friend, General John Caldwell, leading a group of pioneers to the western part of Kentucky to settle in the portion that would later become Christian County. After a time Terah Templin and the general moved on to Livingston County, the southern half of which is surrounded by three rivers – the Ohio, the Cumberland and the Tennessee. Here he lived until the death of John Caldwell, at which time he returned to Washington County. 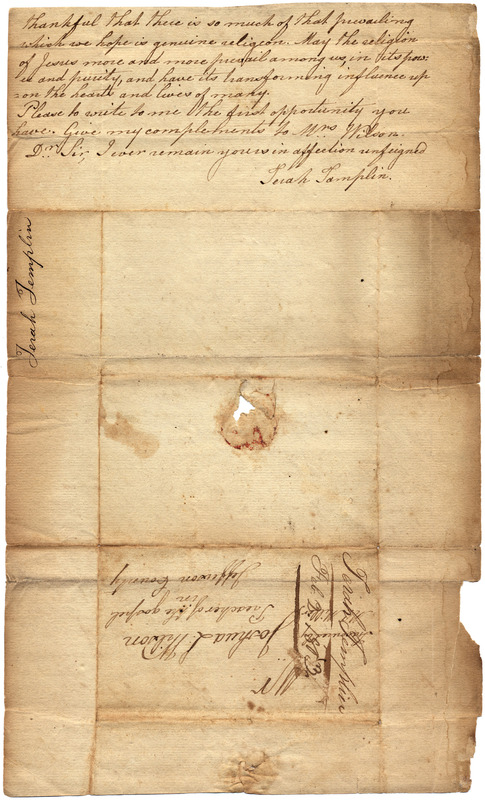 While in Livingston County Templin wrote to Joshua L. Wilson, preacher of the gospel in Jefferson County. He mentions ministerial vacancies in area and hopes Joshua will visit and preach for the people. The letter is a good example of those of the time period, with a lean towards religion! Beautiful penmanship. Yours of October 9th came safe to hand for which I thank you. You say you intend to pay a visit to our part of the country. I should be glad if you could find it convenient so to do; preaching among us for some time past, is much more acceptable, and much better attended upon than formerly, and I hope you would find that your labour would not be in vain. There is a vacancy about 14 miles below where I believe that is somewhat promising, there has been a stir of religion among them for some months and a number I hope have got true religion. There is a prospect of another vacancy forming a few miles below that, so as to fill up the space between that and the Ohio River; these two vacancies if prospered would be able to call a Minister. If you could visit and preach among them, perhaps after acquaintance it might suit both you and that people to settle among them. I should be glad is such an event should take place; and if you are not yet engaged. I hope you will take the matter under consideration. thankful that there is so much of that prevailing which we hope is genuine religion. May the religion of Jesus more and more prevail among us, in its ? and purity, and have its transforming influence upon the heart and lives of many. Please do write to me the first opportunity you have. Give my complements to Mrs. Wilson. Dear Sir, I ever remain yours in affection unfeigned. 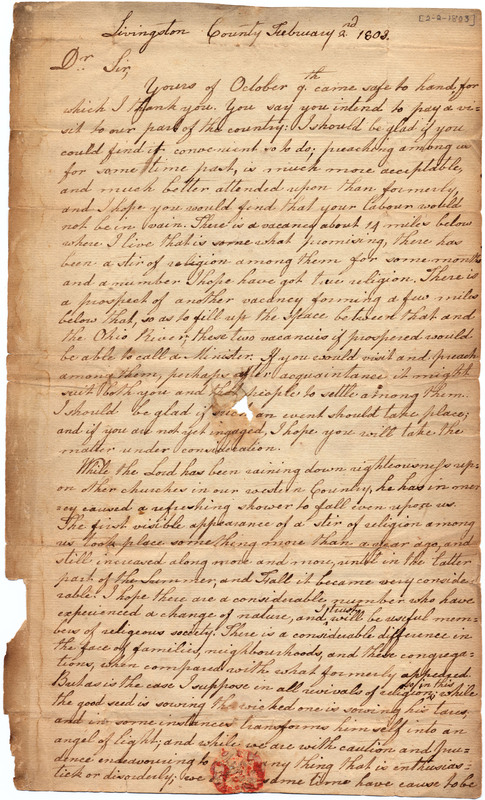 When Terah Templin returned to Washington County he lived with John Reed, clerk of the Washington County Court (you have seen his name on the many marriage bonds and wills I have posted) until his death which happened October 6, 1818, in Nelson County. He died of typhoid fever. Transylvania Presbytery, Bardstown, Ky.: With the most tender and affectionate recollections, this Presbytery records the death of the Rev. Terah Templin, which took place on the 6th day of October 1818. He was admitted a member of the presbytery at its first meeting in Kentucky on the 17th of October 1786, to all the duties of which, while he continued with us, he was a faithful and punctual attendant until his death. During the whole course of his religious profession he daily appeared to walk with God.